In the past Norman Osborn reveals how spider-man got his powers to a scientist who’s task is to recreate the spider which bit Peter Parker and gave him his powers. Spider 42 is seen. In the present Osborn is finished and oscorp is shut down. A man breaks in and steals a red box from one of the vaults and Spider 42 hitches a ride unknown to him. The next day Miles and his parents are rushing to a community school lottery so there son has a chance of going to the much in demand school. No one believes he’ll get in but they are selected, number 42. Miles visits his uncle Aaron and Spider 42 bites him. He has a seizure and passes out. He awakens to his dad and Aaron fighting and makes a break for it. When his dad comes after him, he walks right by……..his camouflage powers have kicked in! Cover-All of them are Gorgeous and eye catching! The standard has a CG like quality to it’s Spider-man, while the plain white with the spider symbol is striking in it’s simplicity. My favorite however is the cover with Miles unmasked in the daylight. Beautiful! Art– The interior art courtesy of Sara Pichelli deserves much praise, this woman is bad as a mutha! Sara particularly excels at drawing faces with emotion. Miles feels very real thanks her art work, in fact the world she draws is very modern, very normal and very uncomplicated with a very pleasing aesthetic. Miles Morales- Bendis introduces us to Peter Parker’s replacement here and he immediately places his personality and family front and center which is a good thing. Wile Peter was a nerd who was picked on and lacked courage he never quite fit into the background as much as Miles. Miles only real talent in the outset is pure luck! His landing in school was a1/700 possibility as was his being bitten by the only other spider from Oscorp able to pass o it’s abilities. Central to Miles as a character is his compassion an empathy much like Peter as characterized by his dorky intelligence. Having both parents also differentiates his home life from peter. While uncle Ben was clean and wholesome hi uncle appears to be the ultimate version of the prowler. Very different backgrounds it’s even implied his father may have had a shady past and we don’t know Jack about his mom yet! Plenty of potential! 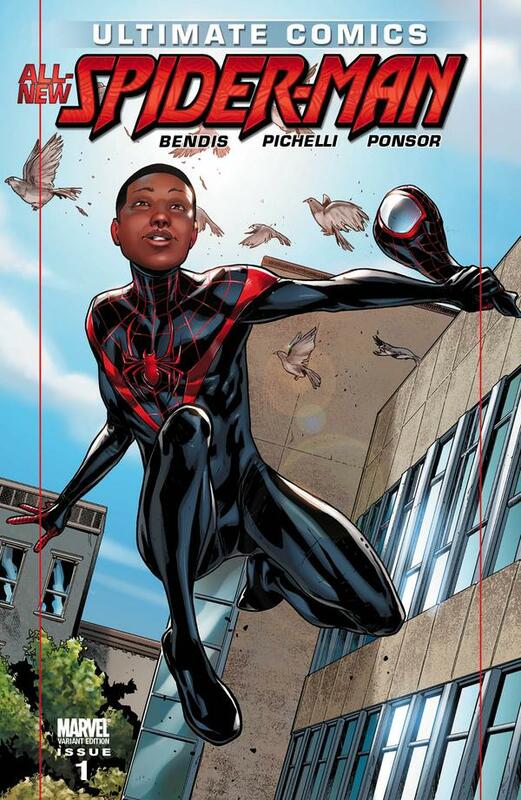 Origin– I loved how Bendis ties Miles Morales origin back to the spider-man mythos and Norman Osborn. Short- I’m sorry Bendis but your treating a comic as a fifteen second commercial is not working for me! I feel like I just paid full price for 1/2 a comic book. You will either love or hate his writing style but after new avengers I’m sick to death of stretching a story to the breaking point. No action- Sure it’s an introductory issue but it’s slow pace will leave some underwhelmed. ← Static! Now with even more shock!? John Rozum is out! ?